Nicole used Plantin Schoolbook to make these spooky treat bags. I added a few little touches from October 31. We filled the bags with sweats for the little guys and, of course, it wasn't done until the ribbon. Cute, huh? Cricut Swarm day at Charleston Scrapbooking! We hold our Cricut Swarm, at Charleston Scrapbooking, on the second Saturday of each month. Open to all who want to come play with other Cricut enthusiasts. Just give The Mom a call 843-569-3559 to claim your space, bring your machine and cartridges and plan a day with the girls. There is no fee for the event. Our Cricuteers will amaze you with what they know and do. Have a cut you want to make and don't have that cartridge? I'll bet one of the other ladies has it with them. See you on November 13th! We start at 9:30am and go until 5:30pm. Evelyn P and the crew decided they didn't want to wait until the next Swarm and made one of their own today. Any time we don't have an event scheduled, we welcome our customers to come use the crop space, free of charge. Just check the calendar, then give us a call ahead 843-569-3559 to make sure the room is open. That's what the ladies did today. And, they had a great time. For other Cricut classes and events, add the calendar to your favorites. On the second Wednesday of each month, we have a Cricut Demo Day. Drop by any time during between 10am and 5pm to get your Cricut questions answered by TheMom. We'll have the machines and tools available for you to try and demonstrate some of my famous tips and tricks for you. Speaking of tricks and treats, TheMom is having some Halloween fun this week. I'll be wearing a different costume each day. Come check it out, then post on the blog or fb, and a 40% off coupon will be waiting for you on your next visit to Charleston Scrapbooking. Remember, you gotta come in and see for yourself. Anyone looking for an original Cricut with lots of cartridges, including the elusive George font? Here's a note I'll pass along from a friend of a friend. "Cricut used only a hand full of times. Comes with 5 cartridges: Storybook, George and Basic Shapes, Sweethearts, Tie the Knot, and Designer's Collection. User manual and cords included. $150 for it all." Post on the blog and we'll get you in touch with her. After 60 fun filled hours of cropping at Charleston Scrapbooking, we drew the winning ticket. Niki White was shocked to hear her number when The Mom read the winning digits. 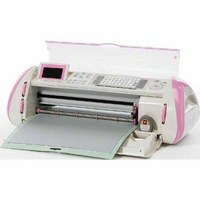 Niki is now the proud and happy owner of the Pink Cricut Expression. You should have been there to see her smile! Post your congratulations to Niki on the blog. She'll be in for her free Cricut 101 and the Cricut Swarms soon. Way to go, Niki! Niki White The Big Prize! Niki and Friends during the crop weekend. Patty and Elena Lisa M. OMG!!! How many cartridges can you take to a crop? You all know The Mom loves to give away prizes at crops. Well, today was no exception. One of the challenges at our Save the Ta-tas crop was 'How many Cricut cartridges did you bring with you? It occurred to me to use that because every one of our Friday croppers today brought their Cricut. Turns out Beth wins again! She brought 48 Cricut cartridges with her. Heather was a close second with 46. Yvonne had 39 loaded on her Gypsy. I gave Beth the choice of a prize from the coveted crop basket, or a ticket for another chance to win the Pink Cricut Expression. She took the ticket. She has an original machine and would LOVE to get the Pink Expression. Still a few spots left for the 12 hour crops this weekend. Come play with us.